Ditch the File Cabinet! A School Year in BINDERS! Home ORGANIZATIONClassroomDitch the File Cabinet! A School Year in BINDERS! I’m sharing one of my FAVORITE things with you today. In my opinion, it’s an essential part of planning and organizing your school year. Best of all, it’s SIMPLE! Like REALLY simple. Clutter and chaos are my enemies. That’s why I LOVE binders. Nice, shiny white binders – with clear sleeve covers. And TONS of clear plastic page sleeves inside. Binders should be called clutter and chaos eliminators. Wonder who I can call about requesting that name change? Here are the top 3 reasons why you should also be obsessed with binders. I loathe file cabinets. I have ONE drawer in a teacher friend’s file cabinet. I keep my math homework in there. Basically it is an out of sight storage container. That’s my drawer there… the one with the dragonfly on it. Keeping my math homework in there is fine. I just grab a stack each week. Then the next week’s is automatically in front. There is no sorting through this cabinet trying to find things. I don’t ever have to LOOK at what’s in there. It was simply the easiest and most out of the way place to store pages that were torn out of 30 books. That’s the ONLY way I use a filing cabinet. File cabinets are great for storing things that you don’t need to sort through. Easy access. Minimize chaos. Eliminate clutter. File cabinets are not very efficient for storing teaching resources. BINDERS are the way to go for those original resources you use year after year. They are extremely effective and highly organized. It is MUCH easier to flip through a binder and see EXACTLY what you are looking for rather than pull file folders in and out of a drawer. Plan a month at a time. Plan each month around a unifying theme or two to bring cohesiveness to your days and weeks. This is a perfect way to fit in social studies and science into your busy, busy day. Use a binder of fabulous resources to help with that planning! Each month should have a binder. 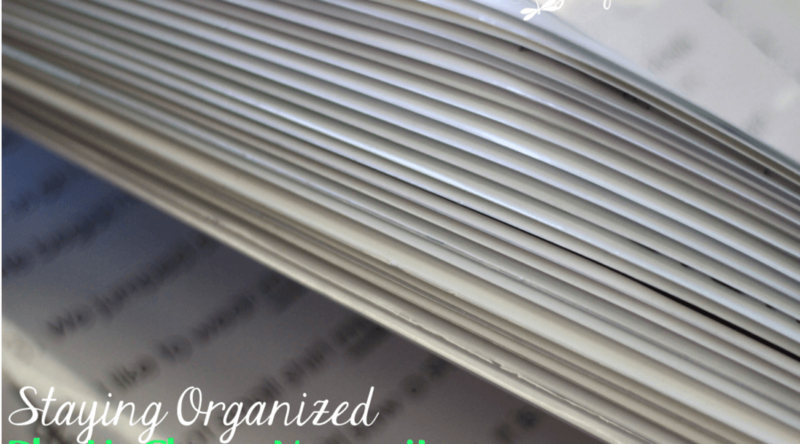 Identify that binder by theme – keeping the focus clear and concise. In that binder place everything used during that month for ELA, math, social studies and science that isn’t in district curriculum. An entire month’s worth of reproducibles/originals in one place. Remember, the key is simplify. Having a BUNCH of binders will hinder your ability to reach that objective. It’s pretty awesome to look in my cabinet and see at a quick glance where I am in the year! 9 months – 9 binders. We are covering weather and matter right now. All that’s left is our ocean habitat unit and WE.ARE.DONE! Place a copy of each original you use in a plastic sleeve. Group these sleeves by copying requirements. When it’s time to prep for the upcoming month, simply pull out each group. Attach simple instructions for parent helpers so they know exactly what needs to be copied. Before copying, flip through your pages to be sure you have included/excluded all that is necessary for your kiddos that particular school year. Also, edit your pages. If you find you don’t like something, throw it away – remove it from your binder. Keep only what you will use. Simplify! In prepping for our 1st grade team, I create a copy request that outlines what needs to be done and required quantities for all of us. We have a volunteer program on campus where parents work in our copy/prep room on different jobs left there by teachers. If no volunteers were available or got to the job, it’s easy enough for one of us to grab the clipped stack and copy what’s outlined. The originals never leave their sleeves, so “refiling” is easy. They just get plopped right back into the binder, snap the rings shut and put back on the shelf. Everything stays in pristine condition – no wrinkles, tears or file cabinet snafus. Another month… done! That’s it. Simple. Quick. And an ESSENTIAL part of an organized school year! Please be sure to follow me on Facebook, my TpT store and this blog so you don’t miss any ideas, freebies and teacher resources! I’m curious. Is this helpful? Does it suit your style? How do you organize your year? For more *Bright Ideas* please check out the links below from 150 different teacher blogs! I hear you! I found that printing them on card stock quite a bit narrower than the actual binder spine makes it MUCH easier to slide them into the binder. You can also write the word master in yellow highlighter and it won't show up on the copies! I try not to make any extra copies – but when I do, it goes to our "scap paper" bin. This is the paper the kiddos use for all sorts of things, including any art or notes they draw/write during "free choice" or independent work time. I also let the students use the extra copies, but our school also recycles all our paper. Love this idea! I am curious about the copying. You said that the originals don't ever have to leave the sleeves. Can you copy through the sleeve? I did not know this!!! While I love the idea of using binders, I loathe the idea of punching holes in my originals (and all that comes with it – taking pages out, replacing them while trying to keep them from ripping…not to mention that hole outlines show up on the copies!). The idea of putting everything into a page protector and copying it that way is pure genius though! I love your system and may give it a try since I need to simplify this summer. I won't be getting rid of my filing cabinet though. I will probably just use it as a different kind of storage. One drawer currently holds all my school survival items such as hairspray, medicines, floss, etc. I really like the idea of storing copies in there too. Thanks for sharing! I have seriously thought about switching to binders but hated the idea of pulling the paper out of the sleeves to copy. I did not know you could copy it within the sleeve so that is great!!! My other hesitation to the switch is not knowing where I would store 9 binders. Do you store them in your file cabinet or do you have extra shelf space to store them? I have shelf space, but you could totally put them in a file cabinet! Love the organization. I used to have binders in which I used to store holiday stuff by month and I stopped doing it when I switched to a more content based curriculum. I have been trying to get back to this system It just need time to organize it all. Maybe over the summer. Thanks for the inspiration. I do the exact same thing! I have so many page protectors! I also have all of my word wall words printed and put in a binder in page protectors by unit in one binder called "word wall." I have a student TA (I teach middle school) so it is very easy for me to say, unit A word walls need to get put up, the old unit was unit B. I have binders for each grade level I teach, RTI binder for each grade, Extension binder for each grade. This year I started to even use smaller (.5 inch) binders for the week. I have tabs for each day and I put what I am doing for the day behind them, each prep has it's own binder. SO MUCH EASIER TO CARRY back and forth because I do NOT have shelving or filing space in my room. All my big binders are at home. I did not know however that I can copy while the paper is IN the sheet protector! Great tip! This is a really great idea! I'm still using the file system and it is very hard for me to keep it in order. Thank you for sharing. Smart Ideas!!!!! Binders are a great way to go! All I can say is, "WOW". I am so jealous of your organizational skills. I have been teaching 19 years and I am always looking for something. I will admit I have moved a lot and changed grades, but still, so envious!! You need to hire yourself out!! I just started doing this for my classroom for next year. It's a little different for 5th grade since we don't really do themes. I've been organizing by resources for different Common Core strands. I'm hoping it is going to make my life so much easier! Thanks for sharing yours! I love binders! I thought maybe I was a little nuts! I just started working through the process of doing this. I am struggling with whether to put things according to standard or month. I have many centers that are themed for holidays or months but I also want to find things for a specific standard. I'm considering putting a page in each binder that cross references to the month/holiday. Thank you for sharing. I have been hesitant about doing this but think it will totally be worth it! Loving binders nuts? NO WAY! 🙂 Your cross-reference sheet is a GREAT idea. For the most part I know which standards I address when, so I am comfortable placing items in my themed binders even if they have nothing to do with that particular theme because those binders are also month specific (my themes/binders cover a month). BUT I also have Language Arts and Math binders to hold those items that are great for anytime. Those pages are organized by standard. I just finished my first year of teaching. I was able to accumulate a lot of resources for future use. I really want to start the binder system. However, it seems very daunting and I really don't know how to get started. I don't want to spend a fortune on the binders and sheet protectors. Where do you suggest purchasing those and is there a way to get a good teacher discount? Do you have any advice? I love keeping up with you on Facebook and through your blog. Thanks so all your inspiration and great ideas. I love the binder idea!! What do you do with your themed centers that have pieces? Do you have another area or do you put them in a page protector as well? Thanks for sharing your wonderful ideas! !